When finals are over and coffee is scarce on campus, the Viking eBikes and eTrike go to the shop for routine maintenance. What, exactly, does that mean? Two weeks ago I emailed Staci May at Earl’s Bike Shop to coordinate schedules. 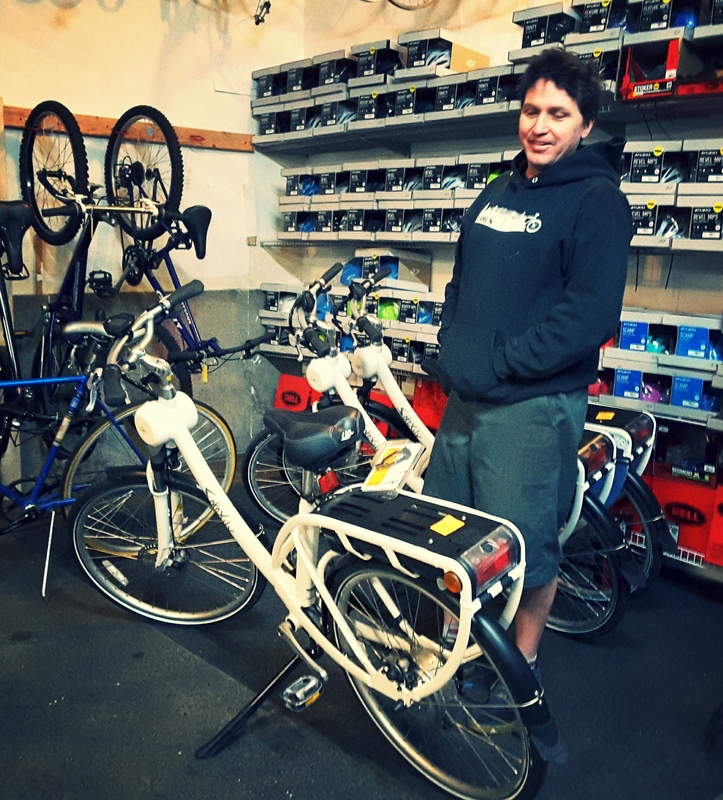 Earl’s is a local shop with expertise in electric bike systems and is contracted to maintain our bikes for this project. Last Wednesday, Rachael Morris of the Office of Sustainable Transportation parked all the bikes outside the OC Bike Shop. Staci drove the Earl’s van to meet Rachael, load up the bikes and bring them down to the shop. The Viking eBike team strives to avoid using vehicles to transport bikes. When possible, we ride a bike to the shop and return on the bus, or on foot, but when all the bikes are going in at the same time it could take half a day to shuttle the bikes so we use the van. Elliot, one of Earl’s mechanics, found that the rear brake pads were not completely in contact with the rotor and identified a part replacement to address the issue. This fix will be billed to the manufacturer. We’re also troubleshooting a chain drop problem, which is annoying but not dangerous. Craig and Staci’s team will install a “narrow/wide” chainring on one of the bikes. Descriptively named, a narrow/wide chainring has two different thicknesses of teeth, alternating to match the inner profile of male and female chain links and allowing for a tighter fit between the chainring and the chain. On mountain bikes where chain drop is a common problem, this has allowed riders to forgo chain guides. (A review with photos illustrating the mechanics can be found here: http://www.pinkbike.com/news/Race-Face-Narrow-Wide-Chainring-Tested-2013.html). This fix will also be billed to the bike manufacturer. 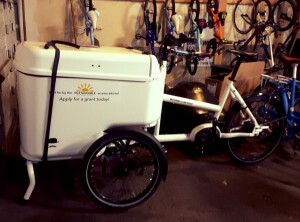 When these parts are installed and tested, Staci will work with Wendy Crandall in the Office of Sustainable Transportation and myself (Beth) to transport the bikes back to campus prior to the start of spring quarter. 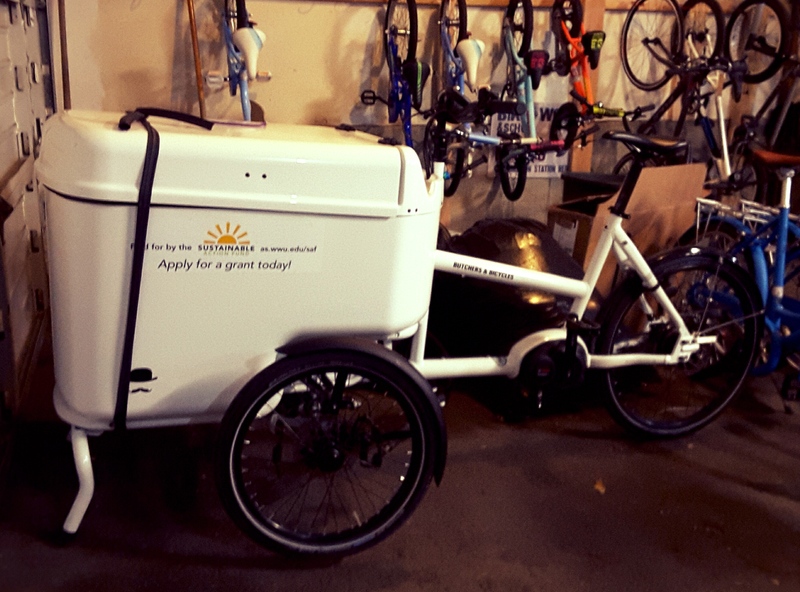 The trike, with it’s belt drive and Bosch electrical system, was already serviced and ready to go when I spoke to Staci and Craig on Monday March 21st. Jeff Bates from AS Publicity is schedule to pick it up by Tuesday and have it ready for AS distribution riders in plenty of time for spring quarter deliveries. Recruiting Riders at the VU! 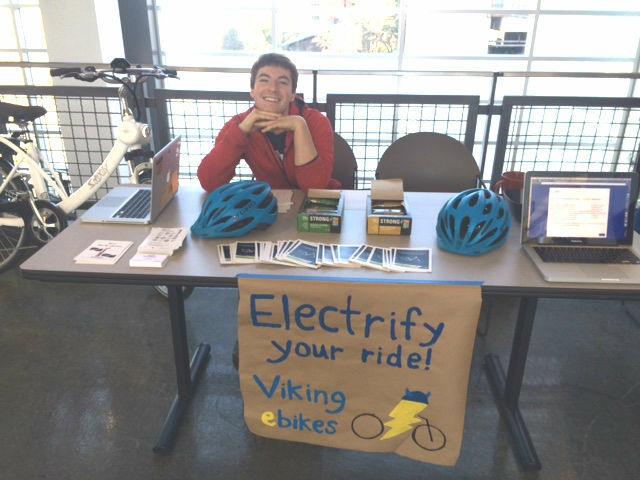 Campus Bike Educator, Josh Kirsch, and Sustainable Transportation Program Assistant, Rachael Morris recruited riders and conducted demos at a table in the VU last week. A nice sunny day plus a sweet table set up in the VU made for a very successful day of outreach. Josh led demos with one of our Solexity commuter bikes. Eight people filled out applications to commute or use the bike for university business! All in all, it was a great success. Look out for more tabling and demos during spring quarter! Missed our tabling event? Don’t worry, you can still fill out an application to ride an ebike as a commuter or for your department. You can also contact transportation@wwu.edu for a short term ebike loan starting Spring quarter.